The inspiring community at maxforlive.com has already given rise to more than 1,600 devices. From traditional synths to wild spectral effects, there’s a wealth to be explored. Here, we’ve rounded up three of our more recent favorites. Even if you don’t understand any of the technology behind phase distortion synthesis, the results speak for themselves - download Phase Distortion Synth and give it a spin. Looking for more Phase Distortion synths? Check out Oli Larkin’s Kasio, also modeled on Casio’s CZ-series, and available free for all Max for Live owners. LittleMidiEnveloper, from Evan Bogunia, creates a custom envelope that can be mapped to any MIDI-enabled parameter in Live, and triggered on demand. Create gradual curves or wild spikes - download LittleMidiEnveloper. You’re familiar with Live’s Chord MIDI effect - but what if you could do the same thing with audio? That’s the challenge Christian Kleine set for himself, resulting in M4L Multipitch, a series of six pitch-shifters, including chord selectors. 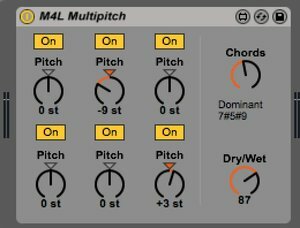 Download M4L Multipitch and get harmonizing.